I wasn't particularly excited to visit a city of over 21 million people. The thought of nearly the population of Canada in one city kind of freaked me out. I've always been keen on visiting the small towns when i'm travelling... However, what I discovered was that one week here was not enough time. We drove from the coast in San Pancho to Guadalajara with some friends we met along the way before catching a flight to Mexico City the next day. I remember banking left over the city before we landed, it was so big, I couldn't see where it began and where it ended. After leaving a relaxing week on the coast, we were quick to sharpen up our senses and stayed alert for scammers or pick pocketers, something I had heard about the city was to be aware of your belongings and to be careful who you trust. We took an Uber to our AirBnB, a beautiful loft above a cute café in a nice neighbourhood. 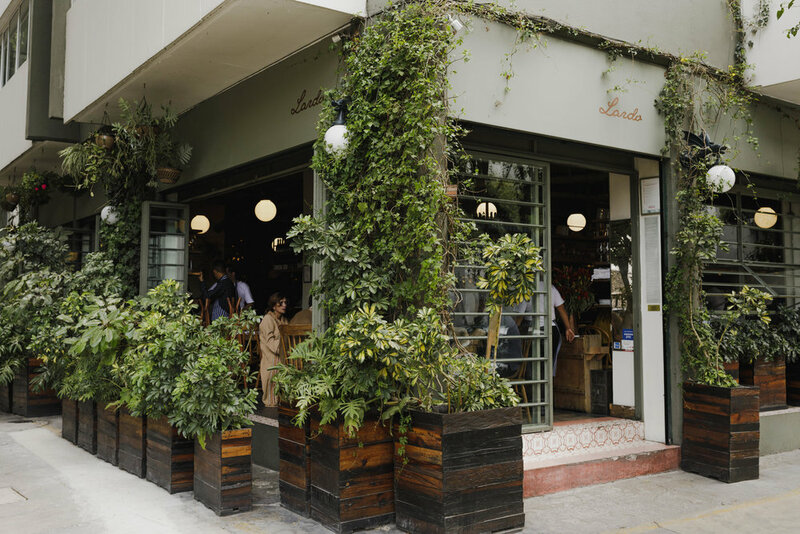 There are a few districts in Mexico City that have been gentrified with upscale restaurants, stores and you get a sense of the division here between wealthy and poor... It also happens to be the epicentre of modern art, culture and design in the city. It's best to either UBER or bike around between neighbourhoods as they span over quite a few miles. We spend a lot of our time in Roma Norté, La Condesa & Polanco. Some of the best restaurants i've ever been to were in Mexico City... we ate pretty cheap meals for breakfast and lunch, and splurged out out dinners at high-end restaurants, which equivalently were about the same price as a decent meal in Canada or the US. We only ate here for appetizers and drinks, but it was one of my favourite restaurants... The food was amazing, the service was top notch and the atmosphere was relaxing. My only regret is not coming hungry for a full dinner. The owner also owns a few other places in the city that are also incredible. Make a reservation before you go, you won't regret it. Beautiful outdoor seating under a maze of string lights. We only stayed for a cocktail, but the menu looked incredible... the drinks were top notch! Some of the best tacos we had in Mexico City... if your Spanish is as bad as ours, you might have a tough time ordering. I'd suggest looking at what other people order and pointing at it. Italian restaurant in the heart of Condesa, the type of architecture that would never meet building codes in Canada, the type of food that makes you wish you could eat more. We did a full course meal with wine pairing and it might have been the best Italian food i've experienced outside of Italy. Cocktails, atmosphere, location. This place has it all. If you want to try your hands at some hard to find Mezcal or an award winning classic cocktail, this is your joint... If you don't show up early, you won't find a seat... For good reason. This place came from a suggestion from a tourist from New York, who happened to be the judge of the international cocktail competition that was happening in Mexico City. There is no real sign to find this bar, it's down a set of stairs in a unassuming neighbourhood. When you make your way into the dark basement, you find a dimly lit bar that feels like a 1960's tiki bar meets a shaman's house. Cocktails are served in a variety of ways, with unique herbs, spices, flavours and glassware. One cocktail came served with a beaded panther skull done by the Huichol people, served with a bamboo straw erecting from the mouth of the panther. Parts of Mexico City are still unsafe for tourists, check online before heading into neighbourhoods. It had been 10 years since I last visited Mexico. The first time, I was only 17 on a family vacation, at an all-inclusive 5star resort. It was also the first time I had travelled outside of Canada or the US. My experience as a naive 17 year old was pretty unremarkable. Although I managed to scuba dive in a Cenoté, explore the ruins of Tulum & Chitzen Itza & snorkel with sea turtles the most memorable part of that trip was probably my first time drinking Tequila followed by vomiting all over myself and the girl I was trying to pick up next to me on a bus. Fast-forward to 2018 and I started realizing this year that except for Thailand in my early 20's, I hadn't really done any travelling... Most of my travel had taken place within Canada and the US, which really started to bum me out. This trip to Mexico was really a hopeful step forward into more travel opportunities this year. Spoiler alert : I wouldn't recommend booking Sayulita as your only destination if you are planning a trip to Nayarit. Truthfully, friends had told me about this place for the last 5 years or so, saying how wonderful it was, a little quaint surf town with a fun vibe, low-key and not very touristy. All of these things rung my bell for a cheap destination only 6 hours from Vancouver, so when Julia asked me to come with her for a wedding, I couldn't resist. I think Sayulita is far enough from Puerto Vallarta that it feels really laid back in comparison, but as I discovered, the further away from PV you go, the better it gets. Depending on when you go, it is touristy / busy. Food is just average overall, this is not your authentic Mexican destination you may be looking for, but a great place to vacation. Honestly, one of the nicest places i've stayed at before, beautiful open-concept villas with the best views, great restaurant, beautiful landscape basically in a jungle. Very quiet and off the beaten track from the main part of the town. Definitely $$$ but worth it for the quiet luxurious accommodation with beautiful amenities. Great location in the heart of Sayulita, only a block from the beach. The hotel surrounds a pool, creating a private space that feels tucked away from the town. The rooms have good amenities, and soon the rooftop terraces will be complete which offers great spaces for lounging. The stay here includes access to a private beach club, which also has food and drinks and a nice lawn. There are lots of options for food here, but we were on the search for the best street tacos. We were a bit disappointed by most of the places overall, except for the Al Pastor tacos found in the evening across from the OXXO store. They had the freshest ingredients and consistency. For fish tacos, there is a place just around the corner from there a block north of the hostel. For breakfast we opted for a place called Organic which served smoothie bowls that were delicious. For a nice dinner i'd recommend the outdoor restaurant at Amor Boutique around sunset as it might be the closest patio to the ocean and is truly a beautiful spot off the beaten track. My favourite bar in town. Great craft cocktails, beautiful space, great music and surf videos. Definitely on the pricey side, but I couldn't help diving into their great list of cocktails + the bartender and owner were great hosts. 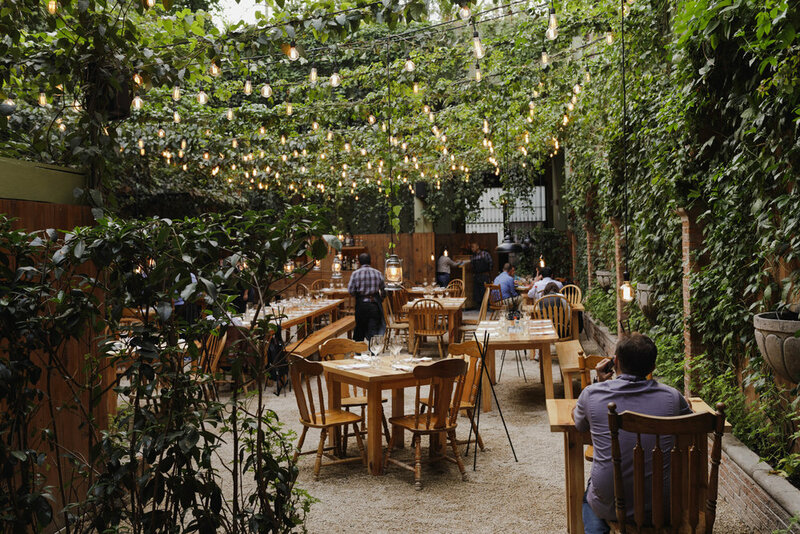 Craft beer tap room, serving local Mexican craft beers in an outdoor jungle space. This was a hidden gem we loved... Very chill vibes in the evenings, covered with string lights and great seating, great space to escape the busy streets of Sayulita. Knowing a little bit of Spanish goes a long ways, being fluent is your best friend. Take the city bus from Puerto Vallarta to Sayulita, it's only 30 pesos each way. The golf cart rentals are expensive, but worth it for at least a day or 2. Playa de la Mortes is a beautiful beach only a 15 minute walk from town, it is also cleaner. If you go even further in that direction, down some dirt roads about 30-45 minutes is a really beautiful beach with nice sand and only locals go there. Highly recommended. The Mexicans don't like plastic either, try ordering your meals with no straws and no take-out single-use plastics. You will often be thanked by the locals. Looking back at the trip, and the only thing I would change is spending less time in Sayulita and more time exploring the coast of Nayarit, to the smaller towns and beaches. We only had a couple of days to explore San Pancho, also known as San Fransisco, just 20 minutes north of Sayulita but already, just getting away that far brought us closer to the vibe we were after. 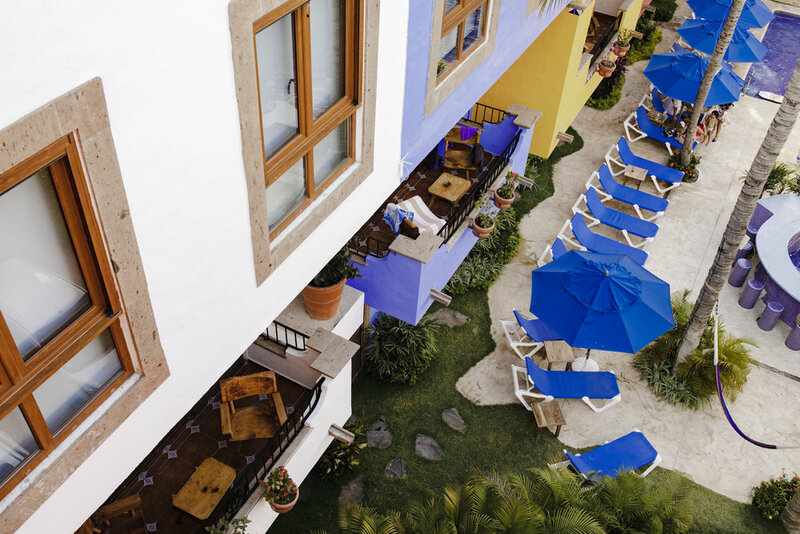 We were lucky to meet the owner of a boutique hotel called Hotel Cielo Rojo, right off the main strip in San Pancho. The hotel is charming and the vibe was inviting... we were blown away by the little shop inside that sold arts and crafts from local artisans and the restaurant on the back patio was the best food we enjoyed on the coast. They served local, fresh & organic food choices with a focus on sustainability. We opted to stay at this beautiful boutique resort 5 minutes outside town. It was quiet and just steps from a nice beach. The resort has lush landscaping, great food and a grassy field for lounging. We stayed during the shoulder season and were one of the only guests, which made for a really private experience. There are tons of isolated beaches just 10-20 minutes away by car that you can often have to yourself. 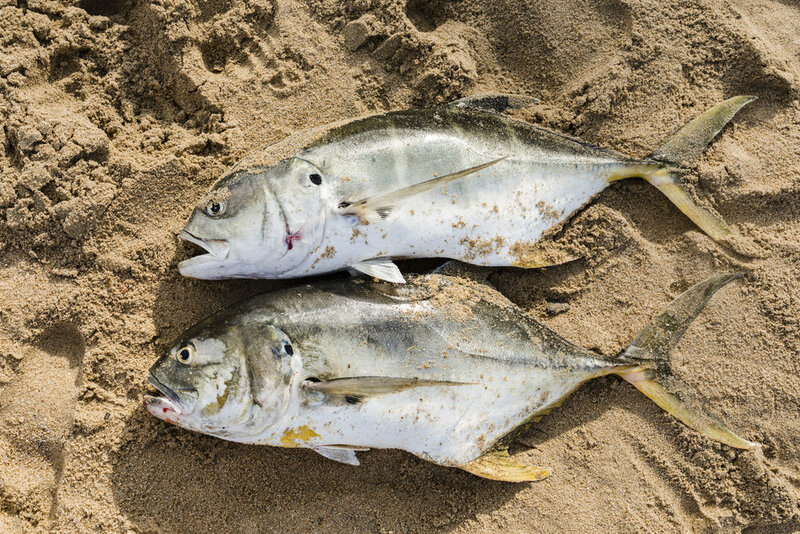 In the mornings, fishermen will fish right from the beach, most likely a catch that you will try at one of the restaurants in the town in the evenings. Special thanks to Visit Mexico, & www.rivieranayarit.com for their support for this trip. This article is dedicated to Anthony Bourdain, an inspiration for travel & journalism who passed away while writing this story.